Alcohol has both short term or immediate effects on your body and long term effects on your health, the seriousness of both being directly related to the amount of alcohol consumed. When someone drinks alcohol, it is absorbed into the bloodstream via the blood vessels in the stomach and small intestine. From there, it travels quickly to the brain, where it produces the well-known effects, of slurred speech, feeling drowsy and lowered reflex and response times and poor coordination, by slowing the action of the nerve cells and the brain. As alcohol is a toxic substance, the bloodstream carries it to the liver. The function of the liver is to eliminate toxic substances, but it can only cope with a certain amount at a time, leaving any excess still circulating around the body. Therefore the more alcohol you drink the greater the “drunken” effect it has on your body. If you continue drinking, as the amount of alcohol in the blood increases, it gradually slows down the respiratory system, meaning that less oxygen reaches the brain leading to blackouts, coma or even death, from excess consumption of alcohol. Long term effects of alcohol on the body. 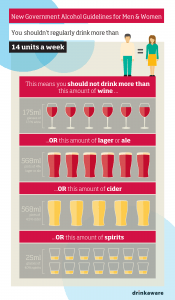 Drinking large amounts of alcohol over a sustained period of time, puts additional strain on many of your vital organs and as a result can result in many serious long term health implications. High levels of alcohol in the blood put enormous strain on the liver. The main function of the liver is to get rid of toxins in the body and so it is working extra hard when there are high levels of alcohol present in the blood. Over long periods of time, this causes scar tissue to develop on the liver which reduces its effectiveness. This is known as cirrhosis of the liver. As a toxin, alcohol causes damage to nerve cells and blood vessels leading to brain shrinkage. This brain shrinkage can mean that the person experiences a reduced ability to process, learn, remember, plan and think logically. They can also demonstrate changes in personality and mood. These are all symptoms of dementia, which has been caused by alcohol. Excess alcohol can cause the pancreas to secrete enzymes internally instead of sending them to the small intestine creating an internal build-up of enzymes in the pancreas, causing it to become inflamed. This condition is known as pancreatitis. Symptoms include abdominal pain, nausea and vomiting. Failure of the pancreas to secrete enzymes can lead to diabetes. Alcohol is known to have a diuretic effect, which means it increases the amount of urine the body produces. Excessive intake of alcohol puts additional strain on the kidneys, making it harder for them to regulate the flow and make up of body fluids. Regular long term consumption of alcohol can also increase the risk of developing cancer of the mouth, breast, or throat.